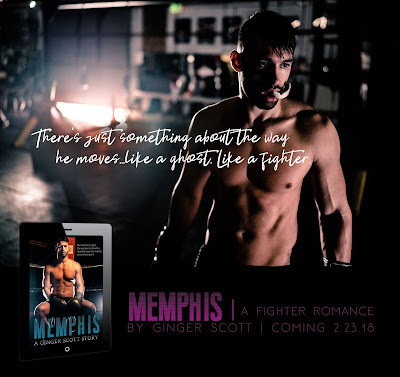 Check out the amazing excerpt of Memphis by Ginger Scott! We are so excited about this release! I never understood it...how love could make you blind and convince you to drink the poison. Not until I met Memphis Delaney. At first, itwas the familiar form. He’s a fighter, built like a god from the past, the kind of man the universe doesn’t make anymore. His eyes hide a story, and every time I’m in his presence I want to keep reading him until I get to the end. And then...there’s the wayhe moves. His boxing is violent but beautiful, and his body is a seductive weapon. When he’s in the ring, he wears the stare of a man committed to the battle until his very last breath. “Come here,” he says, calling me with a finger. I wait a second before giving in, letting my arms fall to my sides as I take the few steps from where I am to where he is. His hands wrap around my biceps as soon as I’m near enough and I breathe in fast, just once. His eyes widen a little. “You’re stronger than you look,” he smirks. My gaze is held by his when he speaks. He holds it hostage and when I start to look away, his hands slide down to my wrists and he shakes them lightly until I look at him again. His head tilts, and he waits until I get it. I’m stronger than I look. “Thank you,” I say, pulling my lip in tight, so afraid I’m not. I’m stubborn for certain. I’m hardened and jaded. I’m not sure if any of that makes me strong. My muscles bend to Memphis’s will as hethreads his fingers through my right ones and lifts my arm, his other hand holding my elbow into my side. He lets go of my fingers and wraps his palm over my knuckles forming a fist and then moves my entire arm forward slowly, stopping when my body lungeswith it. “Here. You lose everything...right here,” he says, stopping my fist where it is then placing the tips of his fingers on my hips. Memphis’s eyes are intent on where his hand rests at my waist, and he pauses to take a breath, his tongue pinched by his teeth, his lips twitching up at the corners, his eyes blinking fast—all in a second. I think about kissing him again right now. “Your weight is already spent, and you haven’t even made impact with something yet. Think about it,” he says, eyes flitting up to mine. I shake my head a little from the brief stare and silence we share. “Okay,” I say, following his lead as he brings my arm back and steps behind me. “You hit me hard, but that was without everything you have behind it. Imagine,” he begins, adjusting his hold on me, his right hand sliding down my arm and covering my hand, feet straddling one of mine from behind, his chest against my back, his breath at my neck and a thousand beads of nerves dotting my skin. “You’re here,” he says, his voice low and right at my ear. My eyes flutter when his left hand runs down the side of my body to my hip, and my breath hitches when he grips it more forcefully. “Yes,” I say, my voice barely audible. I clear my throat and wriggle my hips and roll my shoulders, all under his touch. “You’re right, I’m sorry,” I say, still smiling. A short breath escapes him in laughter. “He’s about to swing, okay?” he says, coaxing me to focus. “Trust me.” His voice falls to a whisper, and my eyes fall closed. Memphis drives my body, the space between us gone so much that I am lying against him while standing. His hand brings mine up, tucking it close to our bodies. His fingers splay on my thigh, and my leg feels strong. He leans with me, our bodies in sync as we twist to the left, our right shoulders stretching backward, necks rolling until we’re nearly back where we started. His hand holds my left side still, and his right hand brings me back to swing with a tighter form than I had before. He takes me through the motion once slowly, almost like we’re just part of some intimate ballet performance, then he brings my fist back in and tucks his chin into the side of my neck. “Again,” he says, this time leading me through the motion faster as his hand slides from its hold on my hip to my diaphragm. “Breathe out,” he says, and I do slowly at first, but with each swing we repeat, the motion is faster. My air escapes with my thrust, my body something mechanical now, parts working in unison until I’m able to do it all on my own. “Keep going,” Memphis says as he steps away. My eyes flit open, and I imagine everything that has ever hurt me. I see their faces—my parents, Enoch, the angry crowds at trials, reporters. Memphis picks up one of the pads and steps closer as I swing, bending down to hand lift one of my abandoned gloves, eventually holding his palmout for me to pause. My eyes lock on hisas he slides the glove over my knuckles and I form a raw fist with my other hand. He takes two small steps back and readies himself before nodding. I clear my lungs and consider his words and everything he just led my body through. I was so strong. I’m stronger than I think I am. My feet shift to find the perfect fit against the mat, and I bring my hands in, fists raised and ready. “He’s going to swing now,” Memphis says, and I react just as he taught me. I dodge. The motion so swift and natural I barely remember doing it before my legs steady themselves, my middle twists and my arm swings forward, fist landing in the same spot as it did before only this time my body doesn’t stumble. Memphis does. Inches, but there is reaction to my action. “Ha,” I breathe out in disbelief. My eyes lift from the fist-­‐shaped dent in the pad to Memphis, and my lips part in awe. Giddiness takes over my face, my mouth stretching wide with parted lips. Memphis lets the pad fall again, and the physical proof from my force disappears as the padding evens out. It was there, though. I fought back, and left a mark. More than seeing it, I felt it. I still feel it. “I want to do that again,” I say, blinking as my vision slides from the pad to Memphis’s proud smile. “Baby steps, Champ. Let me show you a few drills, and then maybe you can punch me one more time before we’re done,” he says, chuckling. “I wasn’t hitting you,” I say, handing him the glove. He holds it in both of his hands before bending down to pick up the other glove, pairing them together. His gaze hits mine. “I know who you were hitting.” Silence settles in for a long second. I don’t have to respond; Memphis doesn’t expect it. Ginger Scott is an Amazon-­‐bestselling and Goodreads Choice Award-­‐nominated author of several young and new adult romances, including Waiting on the Sidelines, Going Long, Blindness, How We Deal With Gravity, This Is Falling, You and Everything After, The Girl I Was Before, Wild Reckless, Wicked Restless, In Your Dreams, The Hard Count, Hold My Breath, A Boy Like You and A Girl Like Me. 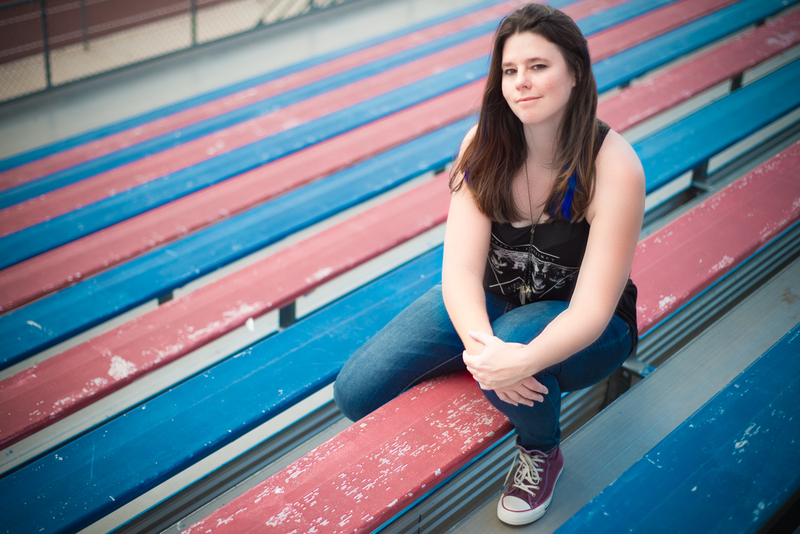 A sucker for a good romance, Ginger’s other passion is sports, and she often blends the two in her stories. (She’s also a sucker for a hot quarterback, catcher, pitcher, point guard...the list goes on.) Ginger has been writing and editing for newspapers, magazines and blogs for more than 15 years. She has told the stories of Olympians, politicians, actors, scientists, cowboys, criminals and towns. For more on her and her work, visit her website at http://www.littlemisswrite.com. Life Update + A Few Goals for 2018!